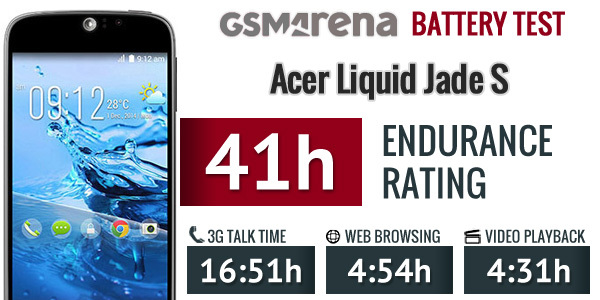 The Acer Liquid Jade is equipped with a 5-inch IPS LCD display with a 1,280 x 720 pixel resolution. Stretched over this diagonal, that results in the decent 294ppi density. 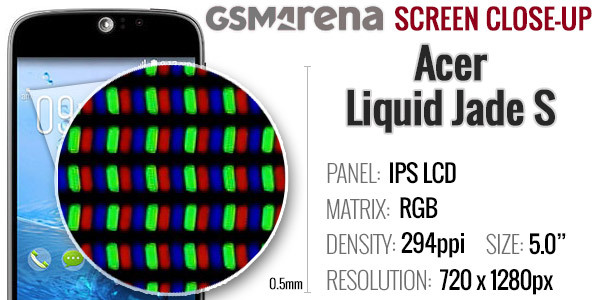 It's not class-leading numbers and competitors can be found, which sport FullHD panels. Then again, the hugely popular Samsung Galaxy Grand Prime gets away with 540 x 960 pixels at the same-sized screen, so it's not among the worst by any means. 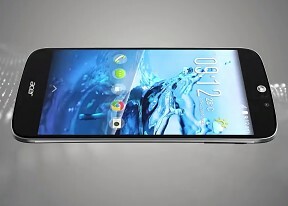 The display gets a Gorilla Glass 3 treatment for resistance to scratches and shattering. The oleophobic coating does a decent job at keeping fingerprints away and is relatively easy to clean. There's no dedicated glove mode on board, so keep that in mind if you live in colder climates. A Reading mode is provided, which aims to negate the adverse effect of blue light on your eyes. It's adjustable from the display settings and pumping it up turns the image progressively greener. Our guess is that this feature will remain off most of the time. We ran the usual set of test, and the Liquid Jade S managed to surprise us, but not in a good way, sadly. The white luminance at the 100% brightness setting was a mere 255cd/m2, one of the lowest values we've ever measured. It's of little consolation that the low black value helped in achieving a decent contrast ratio. It's not impossible, that this was an issue limited to our unit - given that the 50% brightness setting didn't produce much lower results. We'll investigate the matter and update the review if needed. The 50% setting is actually more like 75% and at least that is on par with the competition. Contrast remains virtually the same when you move the brightness slider halfway. On the positive side, viewing angles were quite good, and despite some contrast compression, text remains easily readable even when the phone is viewed at extreme angles. Colors were punchy, yet true to life when viewed head-on, and don't get too washed out when looking from the sides. Sunlight legibility was rather poor, which was to be expected considering the extremely dim overall properties of the display. You'll be better off staying in the shade, as the poor brightness can only do so much. The battery inside the Acer Liquid Jade S is rated at 2300mAh, and that is an average capacity for a midrange 5-inch smartphone. Both the Samsung Galaxy A5 and the Lenovo Vibe X2 come with the same amount of juice, while the Huawei Honor 6 packs a whopping 3100mAh battery. The endurance results were a mixed bag. On the positive side, 3G talk times were respectable at close to 17 hours. We also run a standby battery endurance test, which is not shown in the scorecards below, but is a part of the overall rating. With a single SIM inside the phone lasted just shy of 10 full days in standby. Pop in a second SIM card and standby time drops to a bit more than 7 days, which is still an ok performance. On the other hand, screen-on times were downright disappointing. The browser test drained the battery in less than 5 hours, and video playback longevity was even lower. 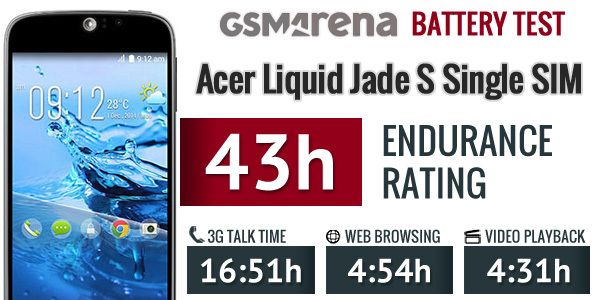 To translate into real-life numbers the Liquid Jade S won't make it to two full days if you do an hour each of 3G voice calls, web browsing, and video playback a day. Heavier use will likely have you looking for a charger before the end of the day. The poor screen-on times render the standby numbers pretty much irrelevant and that shows in the two overall endurance ratings below. Meanwhile, the Lenovo Vibe X2, which doesn't fare too well either, managed a much better 8-hour web browsing stamina. The Honor 6 with its 3,100mAh battery is in a league of its own with 13 hours of screen-on time. The Acer Liquid Jade S has all the connectivity basics covered and even has some speedy support on top of that. First and foremost, it's a dual-SIM device, albeit with a few compromises. SIM 1 gets quad-band 2G, dual- or quad-band 3G, and triple- or quad-band Cat.4 LTE, depending on your region. The second SIM is limited to 2G only, and shares a slot with a potential microSD card. In terms of local connectivity, you get Wi-Fi 802.11 b/g/n with Wi-Fi direct and hotspot functionality for sharing your internet connection with up to 8 other devices. Wi-Fi only works on the 2.4GHz band, though, and there's no DLNA capability. Bluetooth is in its 4.0 version, but there's no NFC functionality. There's a GPS receiver with A-GPS capability and a compass sensor. An FM radio receiver is also on board. A standard issue microUSB port sits on the bottom of the device, but it's not loaded on features. Aside the obvious charging purposes, it can be used for data transfer to your PC, but there's no OTG functionality, let alone MHL output. The Liquid Jade S has a regular 3.5mm headphone jack.